Location: North-west corner of Austin, Texas. 3800 Mt. Bonnell Rd. Operating Seasons and Hours: Open from 5:00 am to 10:00 pm all year long. Recommendation: Good place for an easy hike and a great view of Austin. Let's start this off by talking about how funny I think it is that this place is referred to as a "mount." Mount Bonnell rises 770 feet above sea level. That make it the highest point within the Austin City limits, but its hardly a mountain. I'm from Salt Lake City, Utah which is located in a large valley surrounded by dozens of mountains. Real mountains. Mountains that rise 1000's of feet above the valley floor. I think the mile I walked everyday to get to high school had more of an elevation change that the "hike" to the top of Mount Bonnell. However, I understand that landmark names are all kind of relative. So I'll go along with the fact that this hill is referred to as a mount. Brandon and I took our kids to Austin the weekend after we bought our new Honda Pilot. We wanted to take it on an inaugural long drive. Austin was perfect because it was about an hour away from our home, and even though we'd lived in Texas for 7 months, we hadn't been there yet. Since we'd just paid a hefty down payment on the Honda we didn't want to spent much money on the trip. I Googled "Free things to do in Austin" and Mount Bonnell popped on the results list a few times. 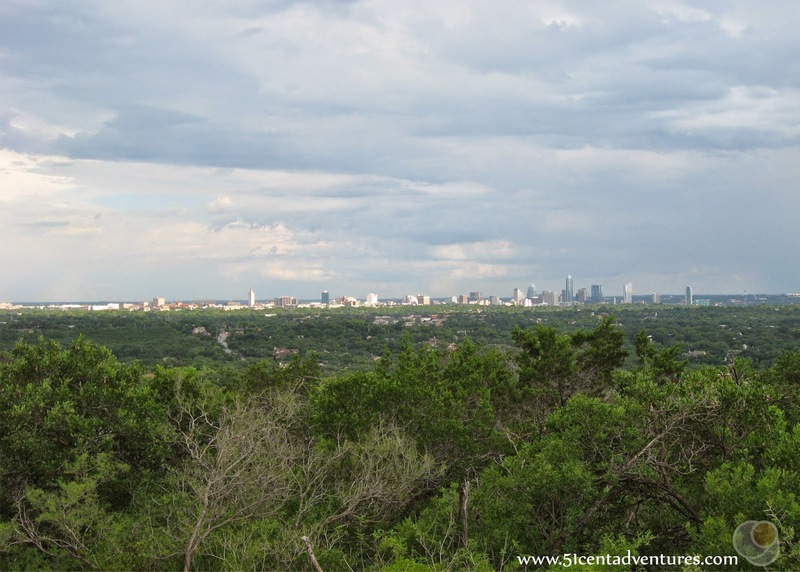 The Austin Parks website described Mount Bonnell as "Best view in town! But first you have to climb a long, long staircase." I was worried about how many stairs made up that long, long staircase. At the time I was starting my third trimester of pregnancy with my fourth child. My older three kids weren't that old - my son was 15 months old and the twins were a little over two and a half. I didn't like the idea of needing to help them all up hundreds of stairs. In the end I decided I was up for the challenge. 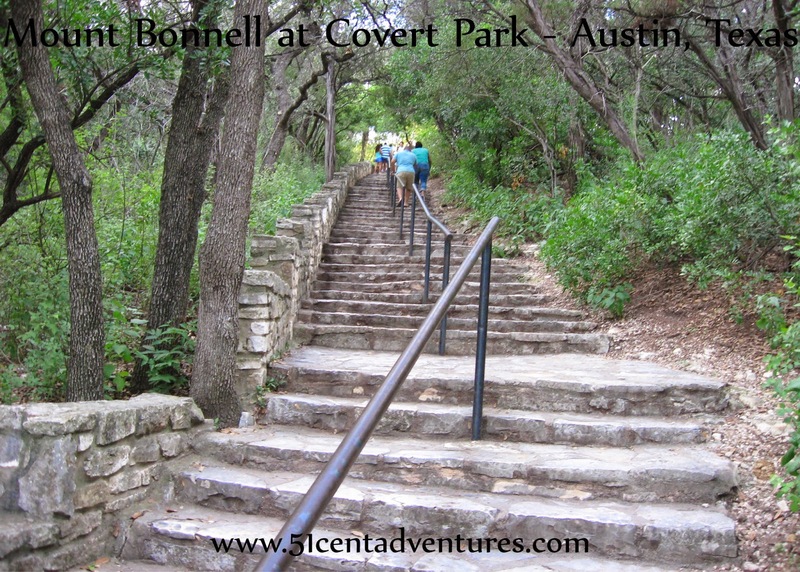 I knew I could count on Brandon to help carry the kids so I put Mount Bonnell on our itinerary for the day along with a trip to the State Capitol Building and Zilker Park. The road up to the parking lot for Mount Bonnell climbed quite a bit in elevation. So I was optimistic that we wouldn't have to hike too much. Still, I was pretty nervous when I looked up from the bottom of this staircase. I imagined several switchbacks to get to the top. Instead I was pleasantly surprised when we reached the top of the staircase and were actually at the top of the mountain. I'd had to carry my son up most of the way so I was a little out of breath, but other than that the climb was just fine. The twins made it up on their own. (Brandon would have carried our son, but our son wanted me to hold him.) For the record, the Mount Bonnell staircase has 104 stairs, and then there are two more steps up to the viewing platform. So there are a total of 106 stairs. 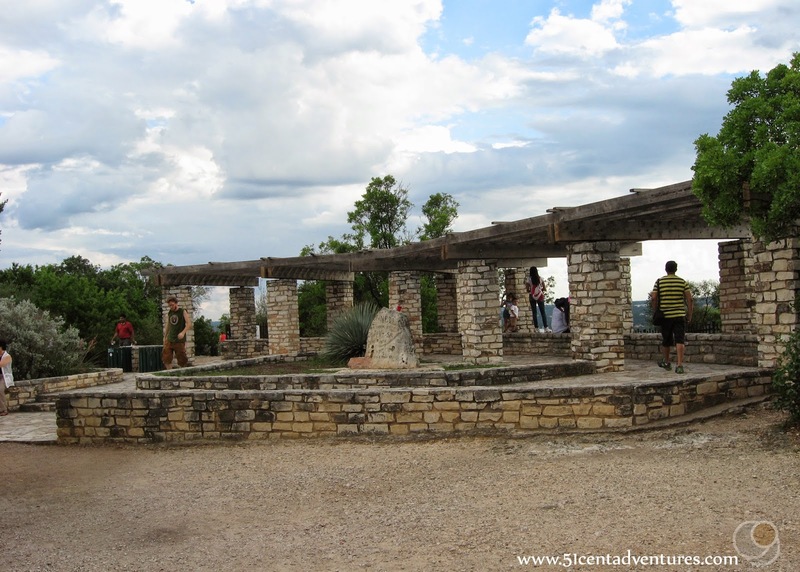 The viewing platform was a stone structure. From there we could see to the south, west, and north. There were some trails that spread out from the viewing platform. The whole area is called Covert Park. To see the Austin skyline, which lies to the south-east, we had to walk down a little path that headed off to our right. It led to an area with some stone picnic tables. We took a little break at the tables. We fed the kids some snacks and enjoyed the view. 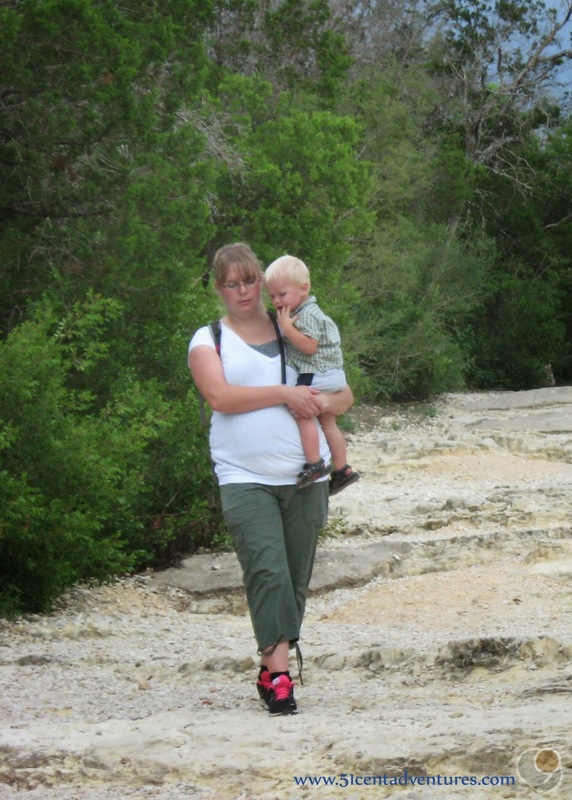 Brandon took one of our twins with him on a little hike on the trails that crisscrossed Covert Park. 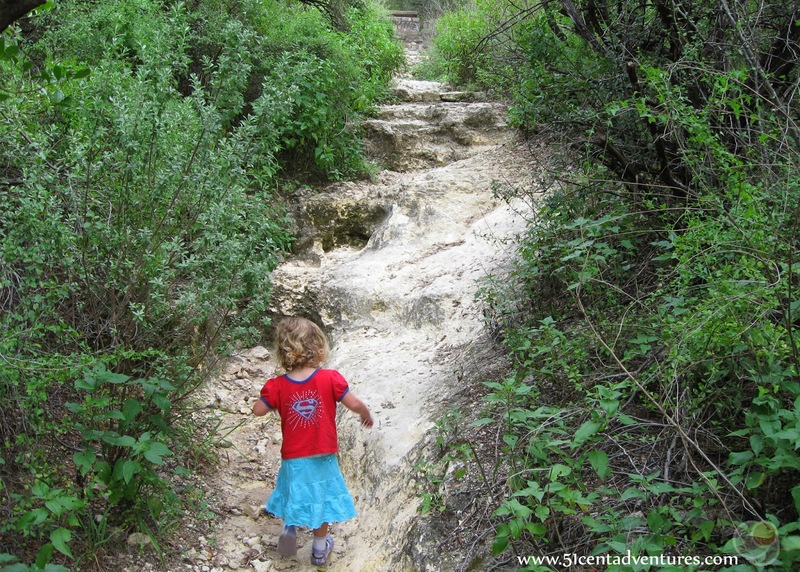 The trails became steep and narrow, but our little adventurer thought they were just fine. 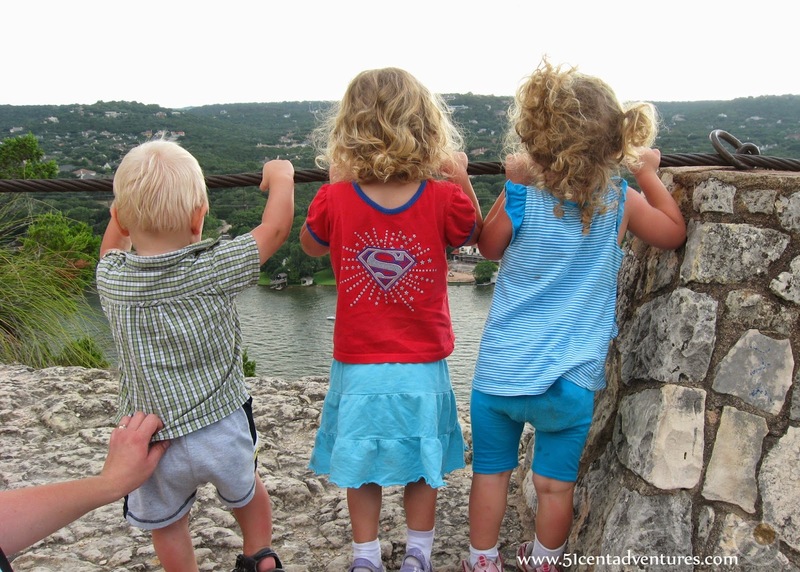 After they came back up to where the rest of the kids and I were, we all went for a walk along the top of Mount Bonnell. The top of the hill has a wide trail that runs from roughly north to south. It slopes down and connects to Mt Bonnell Road on the north end of Mount Bonnell. The trail is rough and has a lot of gravel on it. My son liked playing with the gravel. He also liked for me to carry him. We stopped along the way to take in views of the Colorado River. 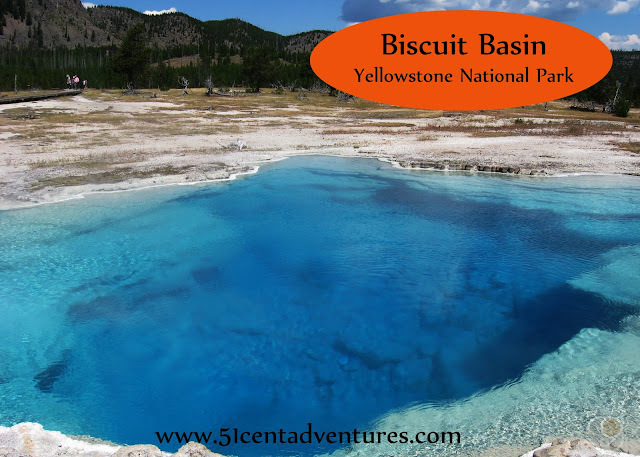 (Not the same one that flows through the Grand Canyon.) Our kids were under strict instructions not to go under the rope railing. When we reached the end of the trail we decided to walk along the road for a short distance to get back to our car, rather than walk back up the trail and then down the stone staircase. The walk wouldn't have been long either way, but this way we were still travelling down hill. As we put our kids in the Honda I overheard this piece of a conversation between a father and his little daughter as they got out of their car. The father said, "no it's not like the mountains in Utah." My husband and I looked at each other and grinned. No it certainly wasn't like the mountains in Utah, but it had been a fun hike anyway. Directions: Mount Bonnell is located in a nice residential neighborhood. No matter which way you travel, you will have to navigate through the neighborhood streets until you reach Mt Bonnell Road. The road will curve a few times as it climbs in elevation. Parking spaces for access to the staircase are on the west side of the road. Places nearby: On our way home we happened to find a little waterfall and swimming hole located at the intersection of Texas Highway 360 and Lakewood Drive. I didn't know it at the time, but this was part of the Lower Bull Creek Greenbelt. We had a quick picnic dinner and went for a little stroll along the creek before it got too dark. 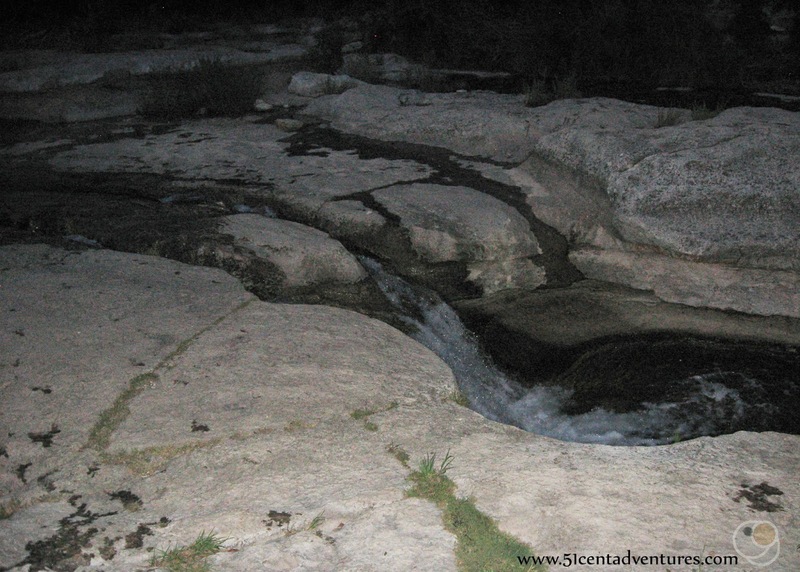 Someday, I'd like to come back to explore and wade in Bull Creek. The swimming hole is less than 5 miles from Mount Bonnell. Additional Information: If you are interested in finding out about mountains near you, you should check out http://www.summitpost.org/. I got a little homesick for Utah as I read the website's list of Utah's 100 most prominent peaks.